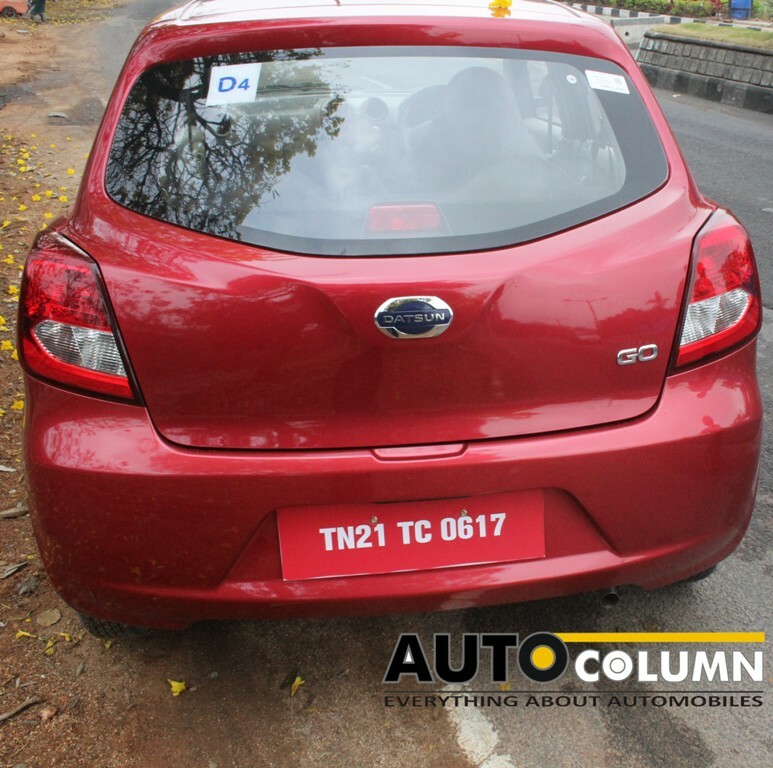 Nissan has revived the Datsun brand to focus on the low cost entry level car market and offer quality products to the upcoming customer at a lower price. The company’s tagline ‘Rise & Go’ reflects exactly this and their new car for India, the Datsun Go ably embodies this philosophy. 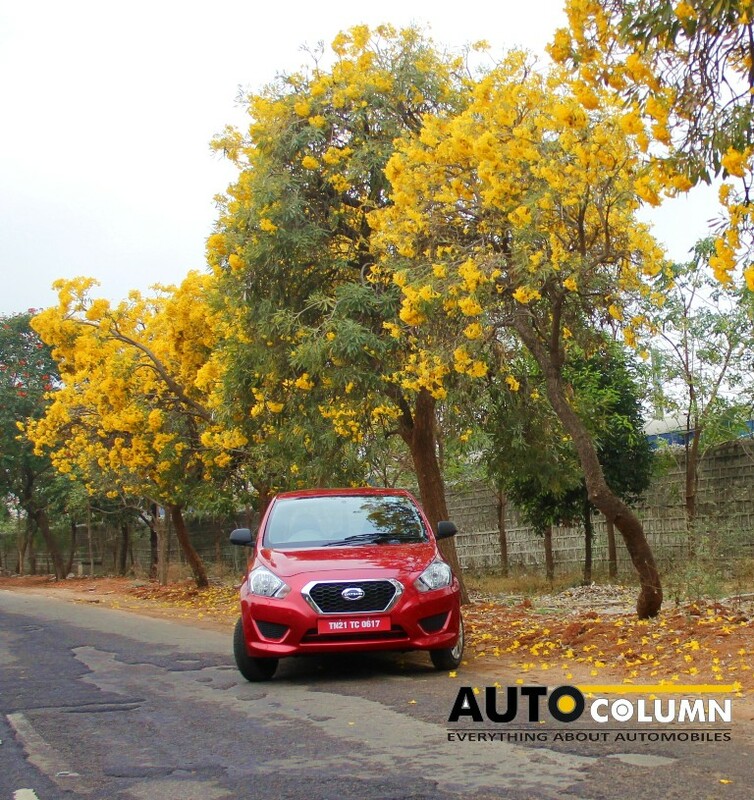 Team AutoColumn gets behind the wheel for an exclusive first drive & attempts to help answer the average Indian’s question- ‘Is this what I want as my first car?’. First though, before we do that let’s profile the average Indian customer whom Datsun are attempting to attract towards the Datsun Go. 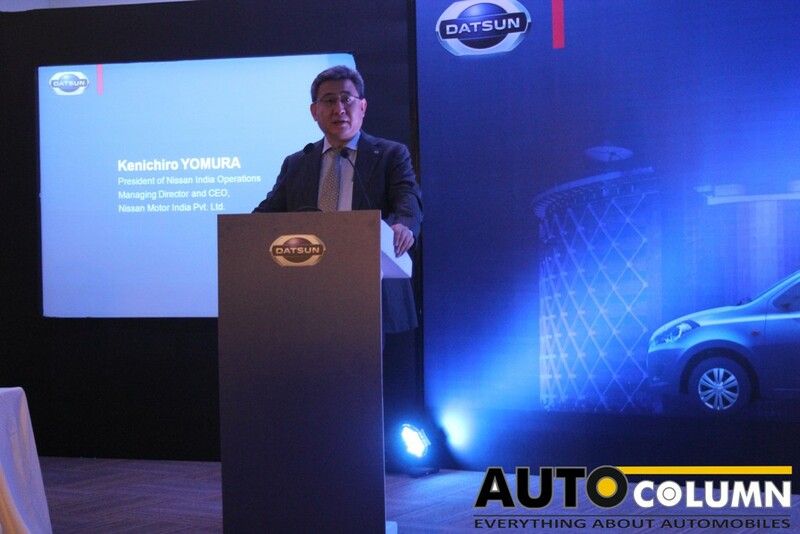 To quote Okamoto san, Chief Product Specialist at Nissan, the average Indian customer wants these things though not necessarily in the same order – quality, reliability, affordability, space, fuel economy, & status. And now let’s check if the Datsun Go really ticks all the right boxes and maybe some more. 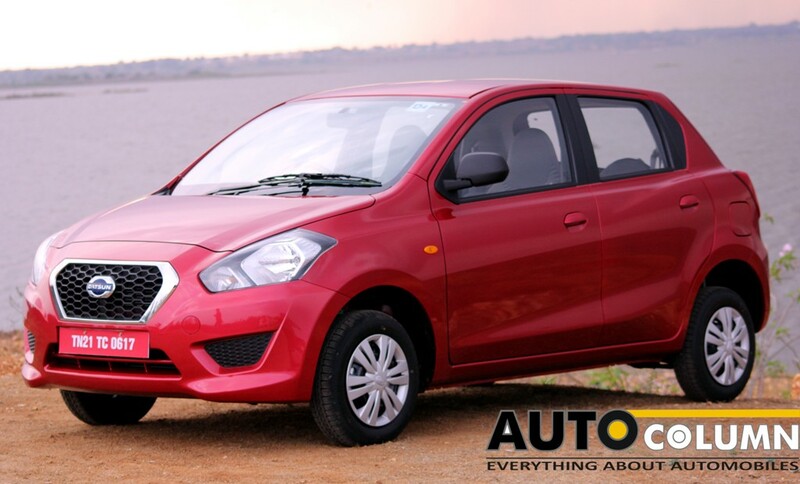 The Datsun Go has aggressive if somewhat quirky styling on the front and the rear. The sides are no exception either, but honestly the styling grows on you over a while. Up front is somewhat a busy affair with a huge chromed grille fighting for attention with two large angular headlamps. The combined effect does look nice especially the hexagonal grille with its chrome surround that Datsun calls their distinctive ‘D-cut grille’. Two lines extend from the upper sides of the hexagon to flow into the hood. The bumpers are nicely styled with three intakes taking up the lower part. 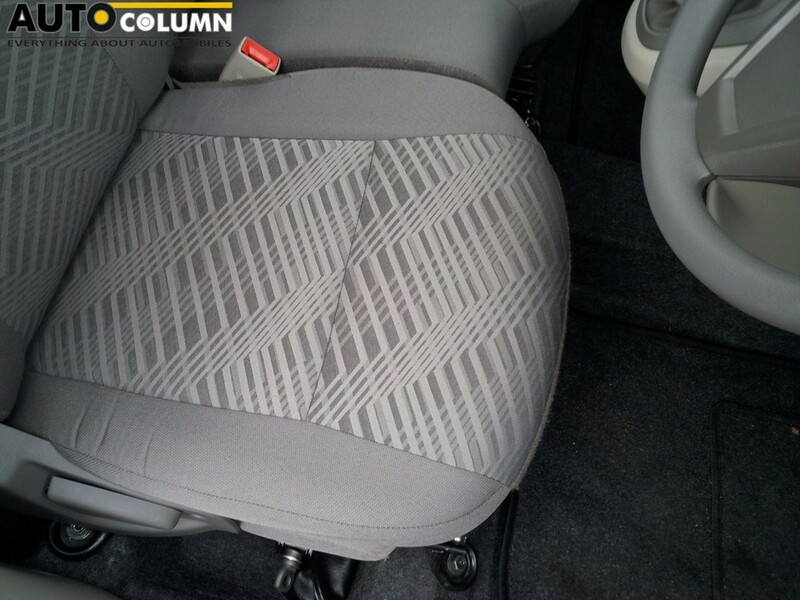 Move on to the sides and you see distinctive side creases and nicely bulging wheel arches. The upper crease that begins from the rear door onwards winds its way around the back giving the rear hatch a nice little notch making the tail lamps stand out. It’s a nice design but honestly the smallish 13 inch wheels don’t really manage to fill up the wheel arches completely leaving gaps that don’t really look good. Discerning enthusiasts might want to upsize their tyre wheel combo soon. Climb into the spacious cabin and you will be pleasantly surprised by the quality of materials used. 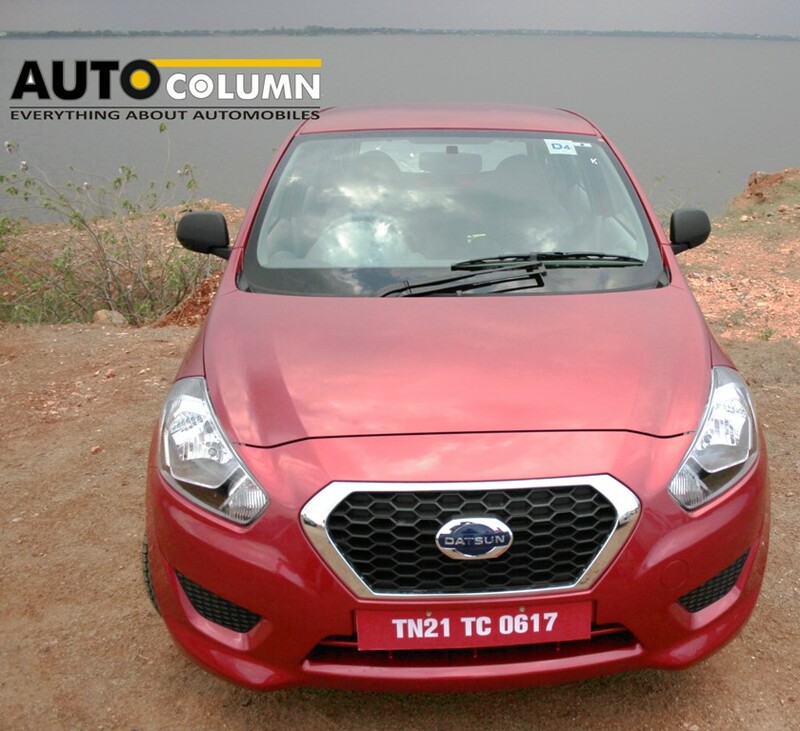 For a cheap entry level car one would expect hard shiny plastics to abound, but the Datsun Go changes the equation here. Nice soft touch leather finish panels in contrasting beige, dark grey & black add a nice contrasting effect. The dash & front facia is done up well & nothing seems harsh on the eyes. Quality of materials used is good considering it’s positioned as an entry level car. The jacquard patterned seat fabrics help & make the passenger cabin look airy & cheerful. In spite of this, in subtle ways the Go still manages to remind you that it is still a car built to a cost, but more on that later. The three spoke steering wheel is nice & chunky & has a single dial instrument cluster behind it. Door handles look familiar don’t they? Let us know where you’ve seen them before. Next to it are the usual telltale lights and under that is a smallish LCD unit that displays the digital tachometer, trip computer, average fuel efficiency & range to empty. Another unique albeit low tech feature is a gear shift guide on the speedo to help you keep your fuel consumption in check by shifting up or down in time. Move over to the centre console and you see something different. 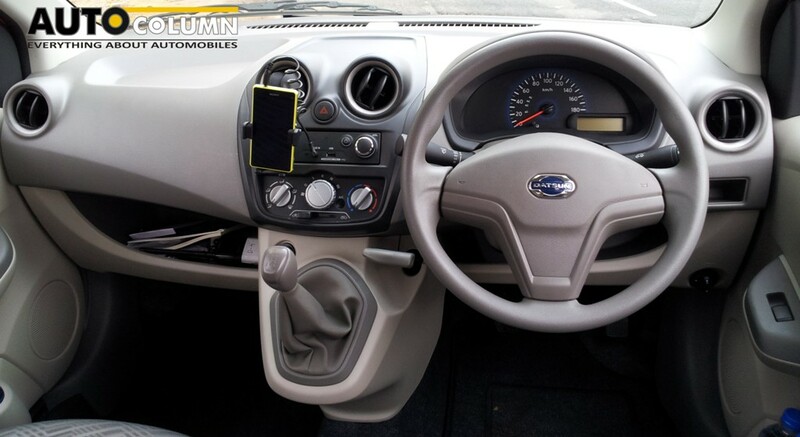 In place of a conventional stereo, Datsun have taken a rather unique step by providing a phone cradle to hold your smartphone. Coupled to that is an Aux in input & a USB charging port. Play your music, navigate via GPS or use whatever app you want to, the Go gives you an option to pipe it into the system & amplify the sound and playback through the onboard speakers. Nice way to reduce costs but a smart move at the same time since these days almost everyone has some kind of smartphone or the other. Unfortunately, since I use a Galaxy Note, the cradle was unable to accommodate the Note’s dimensions and thus I personally was unable to check this out with my phone. The Experia that was supplied with the car worked fine however so I guess it makes sense, but yes a slightly bigger cradle might have helped. 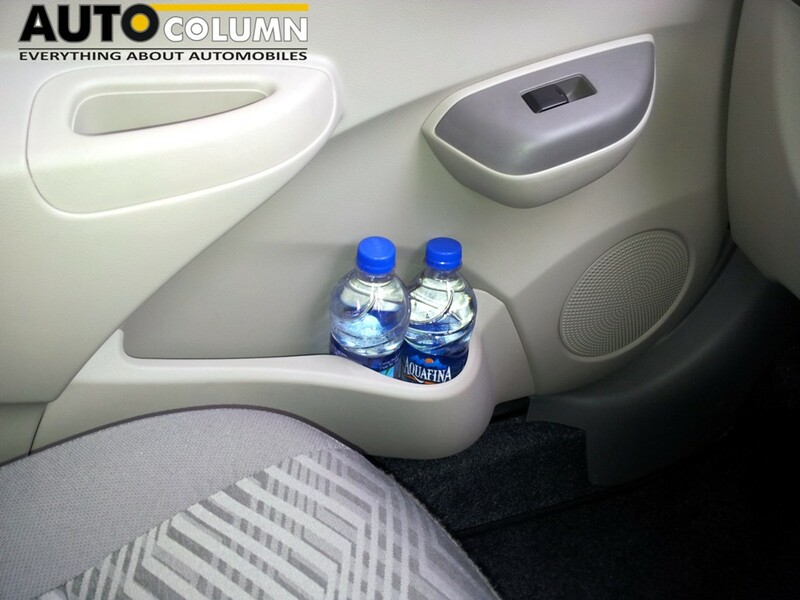 Datsun engineers have opted to keep the gear lever mounted on the centre console much like the Hyundai i10 thereby freeing up floor space up front. They have taken advantage of this by linking the front seats together making it somewhat like a bench seat. The logic behind this being that you can use this additional space to store items & keep them close at hand rather than dump them on the backseat or the floor. I can see the average Indian customer propping up a kid there as we are wont to do in this heavily populated country of ours where 4 people on a two wheeler is a very common sight. 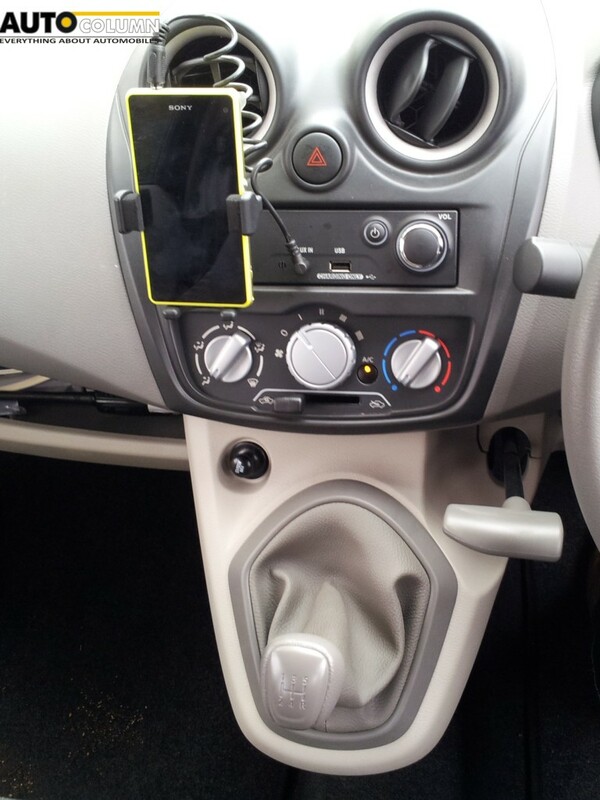 The handbrake is also mounted on the centre console right next to the gear lever. If you are a drifting maniac wanting to emulate also those cool Tokyo Drift moves then well, it’s going to be a tad difficult. The handbrake incidentally reminds me of all those Matadors & Tempo Traxes where you had to twist the handle and then push the lever in to disengage the parking brake. Same story here, nice but quirky. The seats are supportive but a bit thin in the foam department however they have supposedly been designed in such a way that they reduce the strain on your lower back by supporting your spine. Move over to the backseats and you will be again surprised by the amount of legroom, headroom & shoulder space. For once I was happy sitting at the back and had no complaints in spite of being six footer. Some more quirky and subtle hints that I mentioned earlier hinting at a cost reduction mode also abound up front & back in the passenger area. The rear seatbelts are hung onto hooks bolted to the C pillar and they are the plain buckle & tighten type. Kind of like the aftermarket ones that first appeared on old Premier Padminis & Ambys & other vehicle when seatbelts were made compulsory on all vehicles running on Indian roads. In our opinion these are a strict no-no primarily from a safety perspective. They simply cannot offer the level of safety that standard 3 point safety belts do (and they are the baseline as far as seat belt safety goes). We do hope that these are at least offered as an optional extra if not standard fitment. The front has a nice & wide glove box but unfortunately it does not have a lid on it raising questions from a security perspective. It is claimed to accommodate 1.5 litre bottles but without the lid it’s simply not good for anything else. 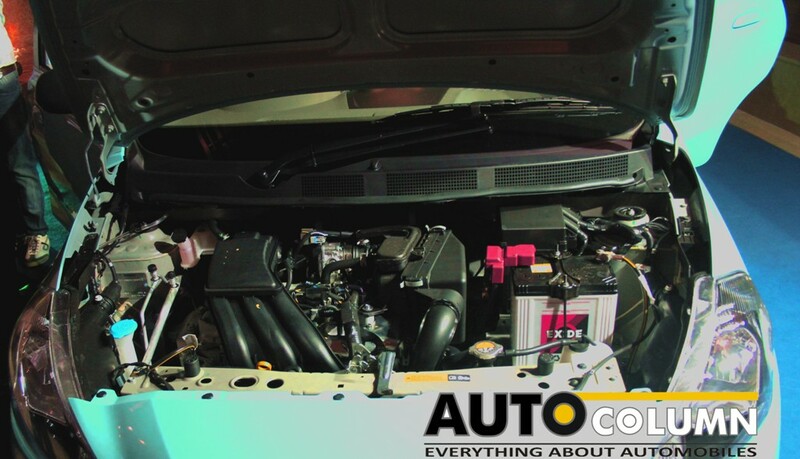 A Datsun engineer did however mention that they are working on under seat storage lockers to store valuables and other items so we are hopeful to see this being offered as optional extras again. 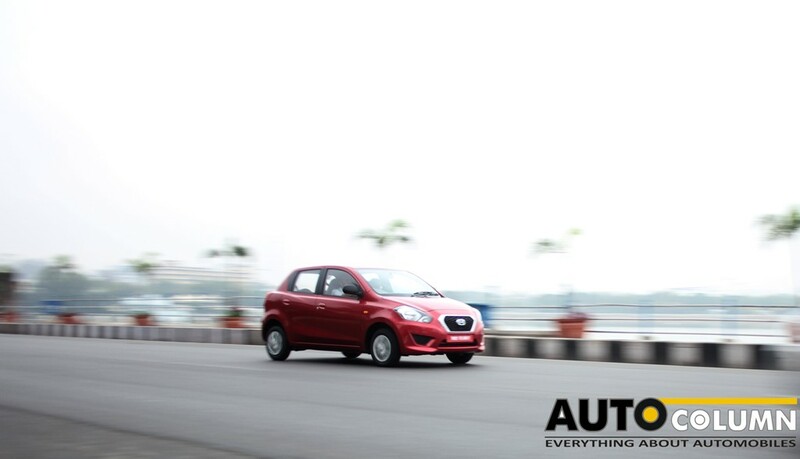 The Datsun Go is propelled by a three cylinder 1,198 cc petrol engine mated to a 5 speed manual transmission. This setup is good enough for 67 Bhp & 104 Nm of torque and a claimed 0-100 kmph in 13.3 seconds. Of course, the kerb weight of just 769 Kg also helps. This is a lightweight runner with a big engine. It certainly does pull away quite easily & gear roll-ons are good too but the notchy gearbox can be a letdown at times preventing slick shifts. 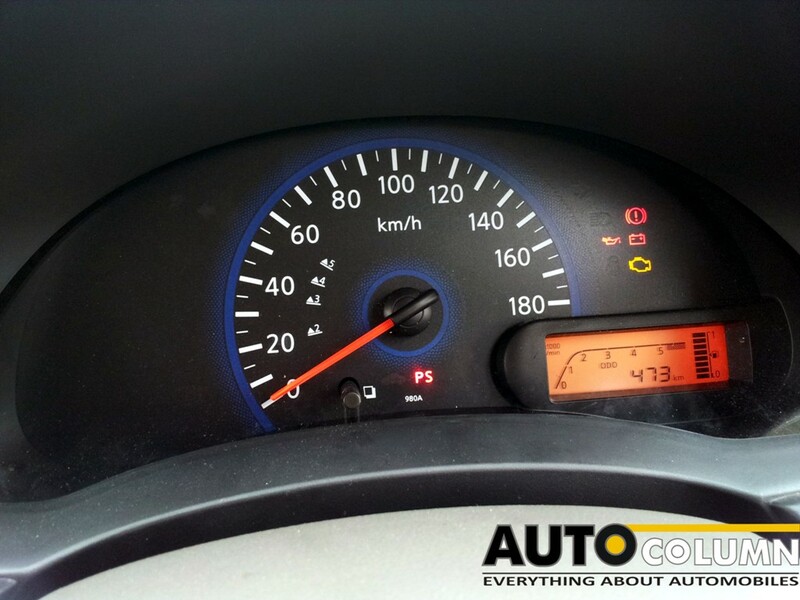 Datsun claims that their race derived perfect circle bore technology helps with this performance while also delivering excellent fuel economy with a claimed 20.63 kmpl. On the suspension front the Datsun Go runs a double pivot front arm suspension up front with a torsion beam setup at the back. All of this results in longer suspension travel and a higher ground clearance. Datsun engineers have also provided high response linear dampers that are used primarily on their Infiniti brand claiming to offer lesser pitch & yaw on the car. We however felt that it was a bit on the bouncy side and the overall setup was actually transmitting more than necessary impacts in the passenger cabin. Bear in mind though that we were in media cars that were being used for a media event & as such will give Datsun the benefit of doubt on this. A further & longer drive will reveal more and we will definitely keep our readers posted as and when this happens. The Datsun Go claims to provide many unique first in class features for a vehicle in the entry level category & these certainly do have the potential to make it a top seller from the word go!! For a car that aims to be priced in the sub 4 lakh bracket features like follow me home lights, fuel range computer, factory provided mobile docking station (as opposed to no audio systems on other entry level competitors), smaller turning circle of 4.6 m, a bigger engine, Intelligent Wiping Setting that varies the wiping interval depending on what speed you travel at, ventilated disc brakes etc. are certainly game changers. The pricing which is likely to be announced soon will be the icing on the cake. However certain niggles that invariably give it the ‘built-to-a-cost’ image are likely to scare away the young upwardly mobile and socially aspirational customer. We have already mentioned the seatbelt & the glove box earlier on but unfortunately there is more. For example the front passenger & driver do not get grab handles to hold on to while the rear passengers do. 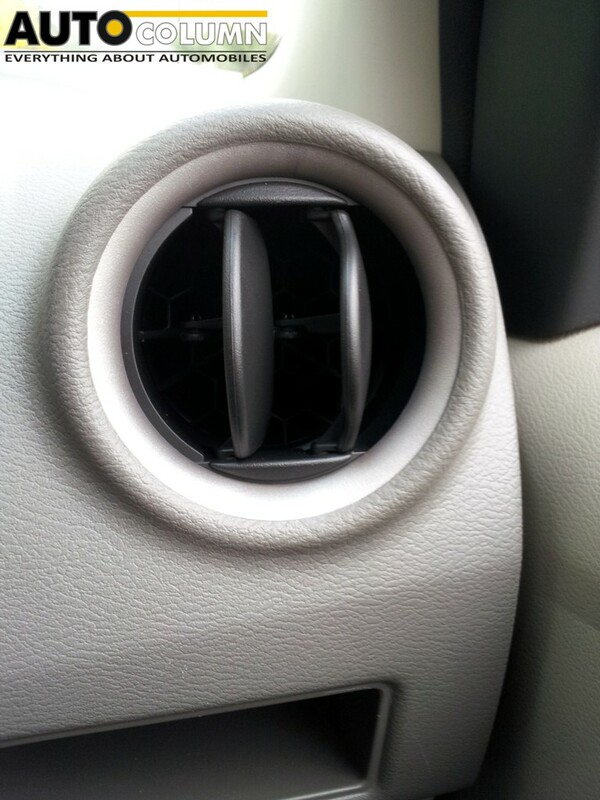 The rear hatch can only be popped open from inside the car by pulling the conventional lever provided under the driver’s seat. 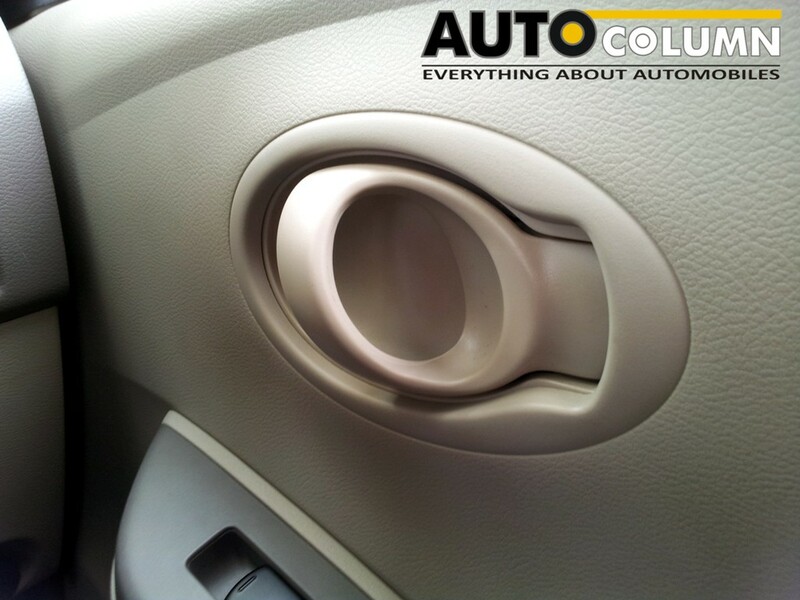 There is no latch or handle on the outside of the rear hatch which tends to create its own set of pros & cons. The small 13 inch wheels don’t do justice to the design of the wheel arches. The mirrors cannot be adjusted from inside the car which can make it somewhat of a problem on rainy days. 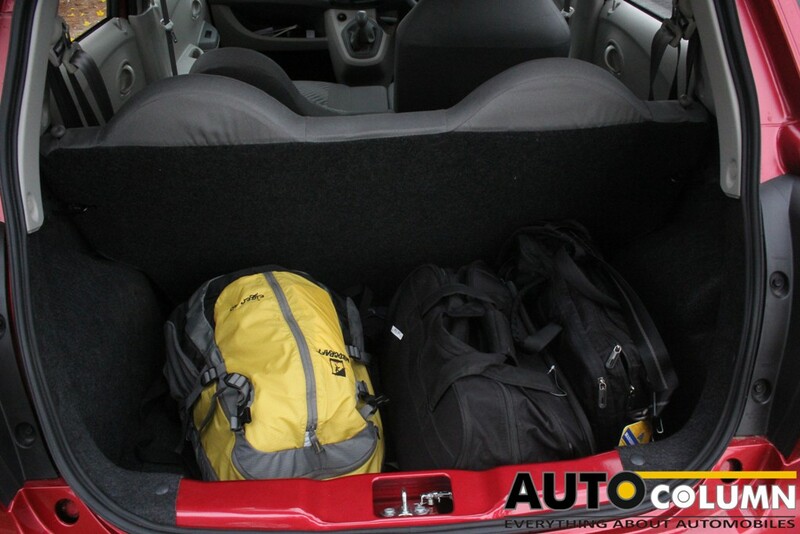 The boot space is quite good but in providing that the customer loses out on a rear parcel shelf. Also instead of a conventional 4 speaker setup we have to make do with only 2. Small little things that might not make a difference in the villages and small towns of India but will definitely count in the metros & large cities. The best way to deal with this would be to provide optional extras and accessories, lots of them. No harm in going the Lee Iacocca way and trying out something like the pony car approach. Datsun already has a solid product in place. We are happy with the car in its purest sense- it drives well, handles well & can hold its own against any of its competitors in that price range. 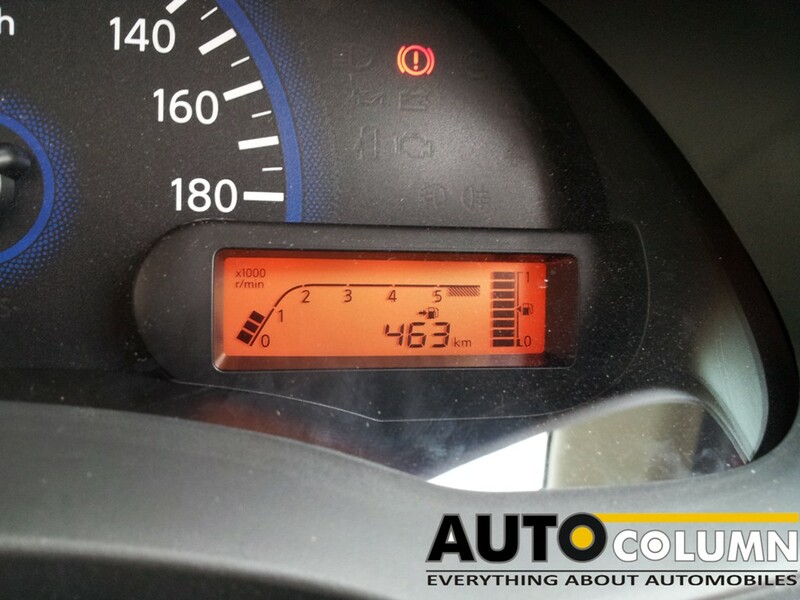 All Datsun now needs to do is provide the customer with lots of options. This customization aspect will certainly go a long way in making the Go a top seller and class leader in its own right. It will certainly strengthen the personal bond that everyone holds with their car & enhance brand image at the same time. We wish Nissan & Datsun all the very best for their journey and eagerly look forward to see how the market develops. And as for you dear reader, remember, you read it right here on AutoColumn.